We have five females and one male. All are black tri's. They are out of Ella and Rock who are both standard size rat terriers. They will come with AKC papers, a health guarantee, 1st shots, and will have their first vet exam prior to going to their new homes. Both sire and dam are PLL clear, so these puppies will be clear. All of the puppies are reserved. This is my sweet boy, Rock. He is just a wonderful rat terrier. He is super smart with a fantastic temperament. Even though we know he is a dog, he doesn't agree. He really thinks he is a human. Rock is a beautiful dog with dark rust points and a shiny black coat. He was bred by Lyndsey Reason, and is out of Reason's Rascal and FireMountain's Yankee Star. Thank you so much Lyndsey for this awesome boy! We LOVE him soooooo much! He is the best dog ever! Meet Katie. She comes to us from Kacye Yates of Dynamite Rat Terriers. Thank you so much, Kacye! We love this sweet lil girl. She is smart, funny and of course very beautiful. She loves the water and her new favorite hobby is Kayaking. Paisley came to us from Catch me Rat Terriers. She is a standard size Rat Terrier and she was bred by Anita Culp of Rock-e-Hill Rat Terriers. Thank you Gail and Carrie for this sweet and beautiful girl. Paisley is now owned and loved by my friend Susie in Visalia. Kenai is such a sweet, cute little guy. 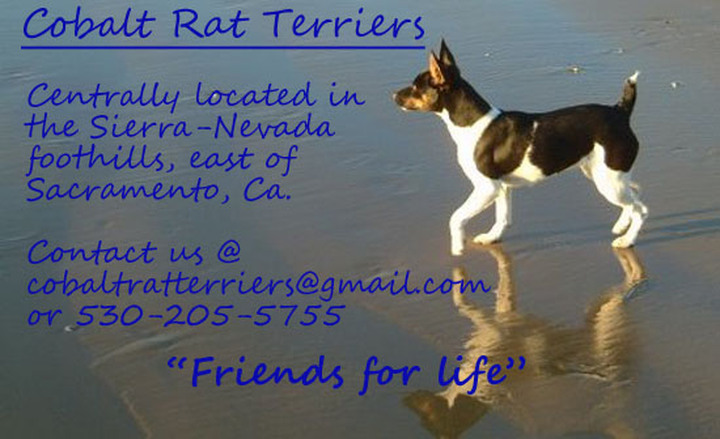 He is from Fair Oaks Rat Terriers in Arroyo Grande CA. Thank you so much Darla, for this wonderful boy. Kenai is living with my niece. Thank you for loving him, Kim. Here are some of our babies with their new families. Thank you for loving them. Skippin CJ Blondie and Reasons Rock Solid will be bred sometime this year. Blondie is out of Legacy of Faith and Diamond Valley Patches. We are really looking forward to this cross. Please contact Christina at Skippin CJ kennel for more information.